Cheerier posts... thats what this blog needs. 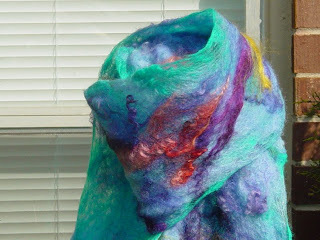 I took pictures of my felted scarf. The successful one. I was intending to post a listing for it but became quickly intimidated. I think that may be my main problem with selling my own wares. I've got to trust myself and then just do it. I would love to put more items in the shop as well as adding some finished products. I have handspun (cause I'm a spinner) but I'm so not a yarn snob. I will work with acrylic if warranted. I have started crocheting a bit but every search on the web brings up really ugly patterns. I want to make something cute-ish. Besides, can't sell something that has been created from a pattern. *sighs* I don't think I have much more to say at the moment so I'll spare the world my rambles now. Remember to take time and create something!